I had heard that winter was coming a number of times this year, but it finally arrived recently with a sudden drop in temperatures and a snow-covered mountain. That seemed a good reason to go for a bit of a walk. I have been up there in snow this time last year but thought I would see whether it had reached the lower levels around Ferntree and the Waterworks by starting at the base of the Pipeline Track and heading up to Sphinx Rock at The Springs. I met my dad (I am still not trusted to go walking without parental supervision it seems) at the far car park in the Waterworks Reserve. I always forget just how beautiful that spot is. The green hills rising up around the reservoir provided plenty of shelter so that the water barely rippled in the sunlight. The Pipeline Track was basically straight up the hill from us, but we decided to take a slightly more roundabout track, which wound its way up to the right. We hadn’t got far before we came across a few benches that had been erected there. It seemed a bit early for anyone to need a rest, but having heard a lot of Bill Shorten speeches recently, I recognise that sometimes even a short time can feel like an eternity and you just need a break. ​After a gentle climb, the track led us back to the base of Gentle Annie Falls. The steps that led up from there are a little steep but we worried about that as little as Michael Diamond worries about gun laws. There are two short consecutive sets of steps with a lookout in between. From the top was a magnificent view back down to the reservoir and through the valley to the city below. After taking our time enjoying the view, we turned back to the track which had now flattened out to a very gradual incline. A short while later we crossed a narrow saddle and by coincidence, we even met a fan of Dad’s photography. We stopped for a short chat, but a chilly wind was racing through a gap in the trees so we soon continued. The track rose gradually continuing up the northern side of the hill. To our right, the valley dropped away more sharply than John Howard’s reputation after the release of the Chilcot report, before the picturesque ridge of Turnipfields rose up on the other side. With the morning sun slanting in on the neat houses and green lawns, the whole hillside looked like an idyllic snapshot to another world or era. After about half an hour, we found ourselves crossing the road to Ridgeway, having just passed the old sluice house. From here the track loosely paralleled Huon Road as it wended its way towards the Ferntree Tavern, although before getting there the track turns away again, passing under a pair of aqueducts that looked nearly as old as Tony Abbott’s social policies, before climbing another short set of stairs to come out at the road. ﻿​We continued to take a pretty relaxed pace on the way back, but were soon past The Springs and onto Radford’s Track. The low arch of the trees and the slope of the track made tunnel descending before us in a pretty good visual representation of the future for the British economy. 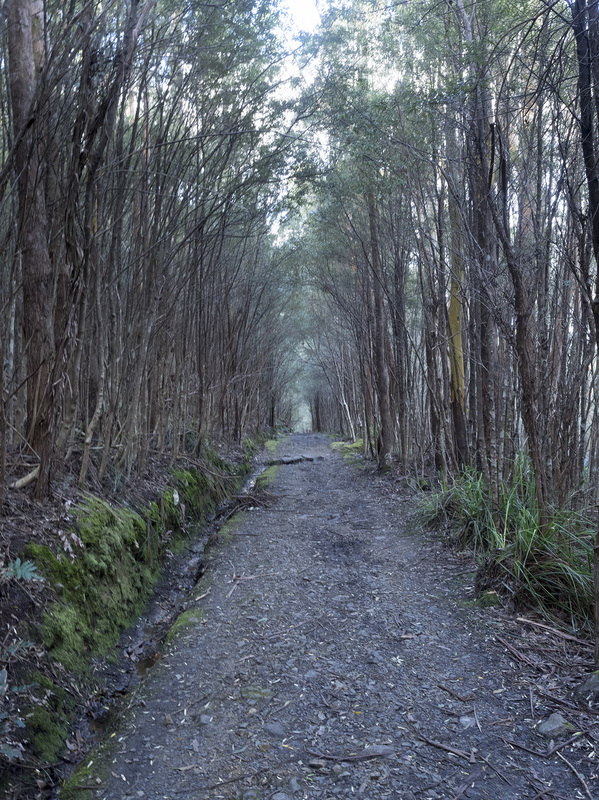 Instead of heading back to the Fern Glade Track, we turned right earlier onto the imaginatively named, Middle Track, which proved steeper and more direct. 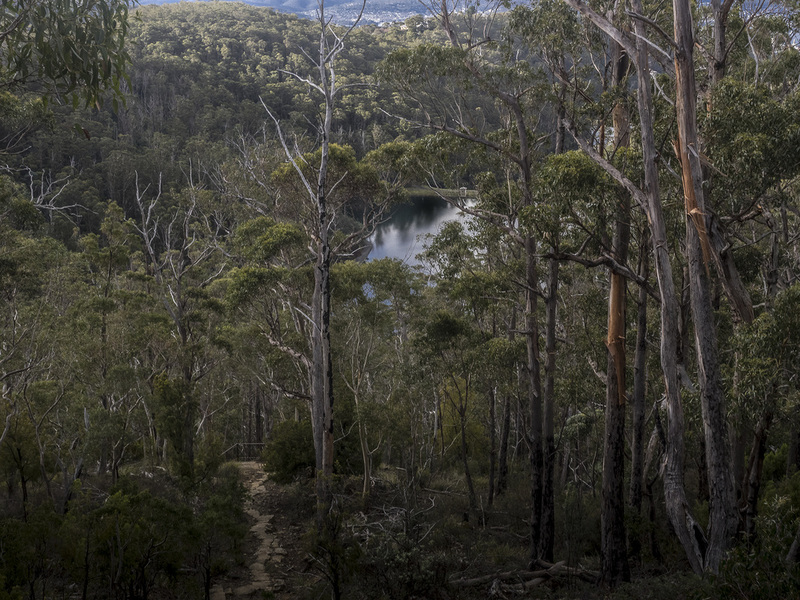 Toward the bottom of Middle Track, we passed the Ferntree reservoir, a large concrete water tower adorned with a surprising amount of graffiti. Considering how far we were from the nearest road, let alone the city itself, it seemed like quite an effort had been made to complete this particular bit of vandalism, but it was pretty inoffensive. ​After Ferntree, the temperature became noticeably warmer. The Pipeline Track is a really pleasant section of the walk going in either direction, so we ambled casually through the quiet countryside. It was only mid-afternoon, but the previously sunny hillside of Turnipfields was already completely in shadow and looking darker than the future of Greyhound racing in NSW. At length we were back at the top of Gentle Annie Falls. We carefully made our way down the uneven steps and took the direct path back to the carpark. ​The Ferntree Tavern carpark was busier than Lionel Messi’s tax accountant and there were numerous people inside and across the road at the park. As indicated by our detour at the start of the walk, we were in less hurry to finish it than David Cameron was to invoke Article 50, so we took a slightly longer route to The Springs via the Fern Glade Track, which follows a shaded creekline below Pillinger Drive. 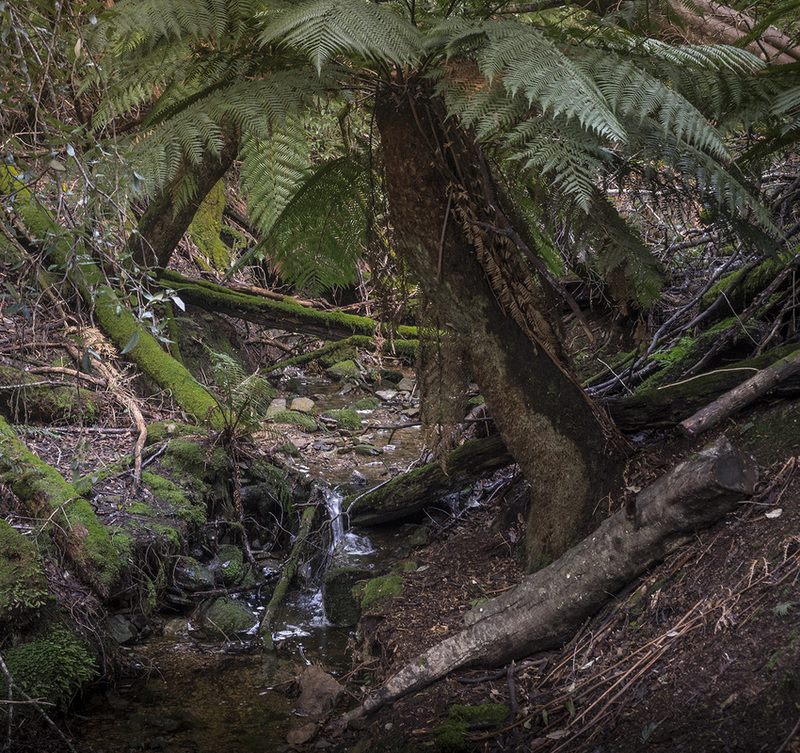 ​The trickling creek was overshadowed by massive ferns and large fallen logs covered in moss, providing a substantially different feel to the rest of the walk. I hadn’t been this way in a long time and my memory of the track were about as accurate as Amanda Sue Markham’s description of herself as a nurse- it was pretty accurate a few years ago but you couldn’t trust it now. Pillinger Drive turned and cut across our path and shot off on its own direction (should really be called Bernardi Drive) while we continued past it, following the track that zigzagged onwards up the steep side of the hill. Eventually the track terminated at Radford’s Track, a wider track that bent around to the south heading for The Springs. The low-arching canopy made it considerably darker, while the temperature had dropped as we had climbed higher, but we were pretty comfortable whilst moving. The Springs was teeming with people, many of whom had been higher up the mountain and come back with snow (which was the only snow I would see close up). The coffee van was doing a roaring trade and judging from comments I overheard was keeping customers very happy. Every man and his dog (so many dogs) seemed to be up the mountain enjoying the sunshine today and we even bumped into an old friend of mine soon after on the track to Sphinx Rock. We followed this track for about 15 minutes of easy walking. Having swung around to the northeast, we had more sunshine so it was warm again and we had great views of the Derwent River below. Reaching Sphinx Rock, we stopped for lunch and enjoyed the wonderful view of our beautiful city. 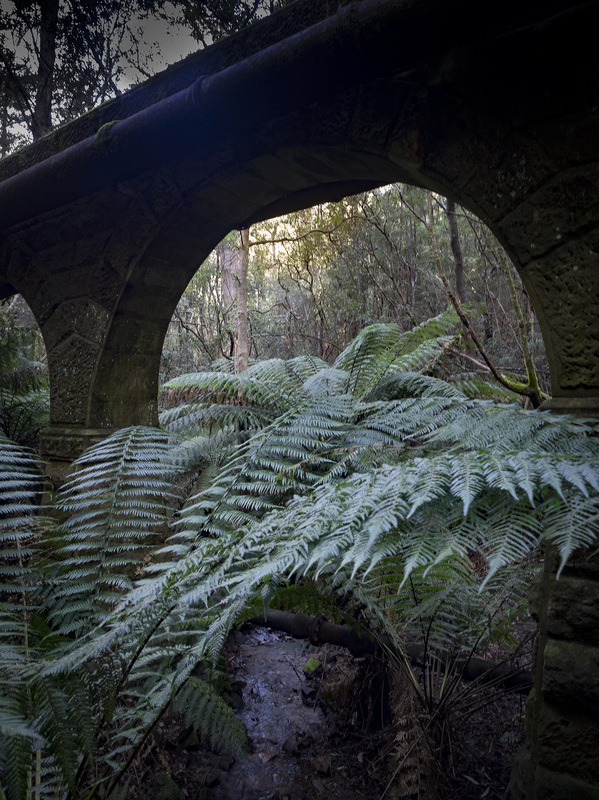 I see something different every time I go there, but it always affirms for me how lucky I am to live in Tasmania. 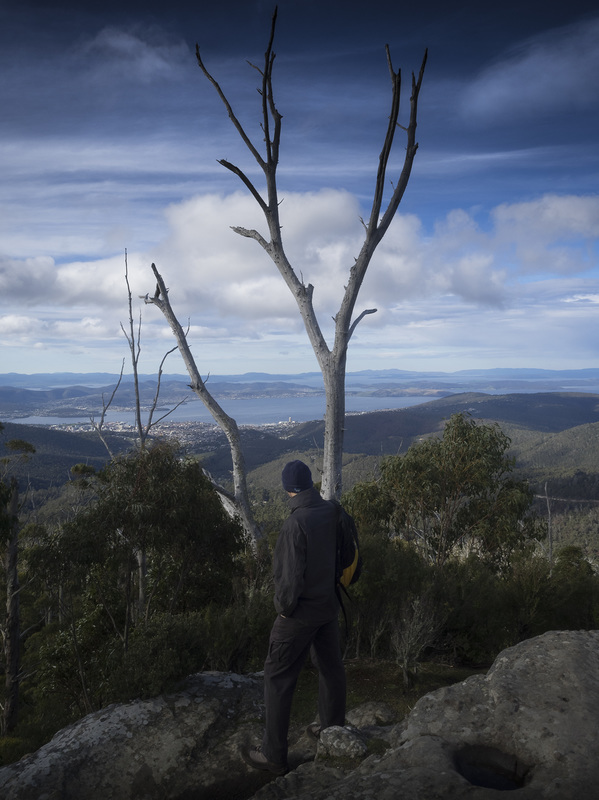 Today I spent a lot of time looking out towards the Tasman Peninsula and peering at the cluster of buildings along the South Hobart rivulet. ​​Considering how many people we had come across on the tracks and at the Springs I had thought the chances of eating our lunch on our own was about as likely as hearing Scot Morrison being honest, but surprisingly we had the Rock to ourselves for the most part. Eventually it was time to head home, so Dad took a quick photo and we headed back to the track.